Halloween is one of my favourite times of year. However. My friends don’t celebrate it so I’m often left to fend for myself – carving out pumpkins (and making videos of them) on my lonesome or finding solace in a good old-fashioned round of Hocus Pocus. The girls do pop up when I need them most though. Rach and Emma came round on Friday for some HP (the aforementioned – not Harry Potter – though that would work just as well) and dinner. Just as well. It may be Disney but is it just me or is it actually quite scary? Still, turning to the TV for some entertainment is no problem. I watched The Shining on Sunday night with my boyfriend and his housemate. I’ve been bingeing on Making a Murder: 2 since it was released. I know it’s a documentary but I’m absolutely riveted – I can’t recommend it enough to get yourself in a tizz about the injustices of the American criminal system. 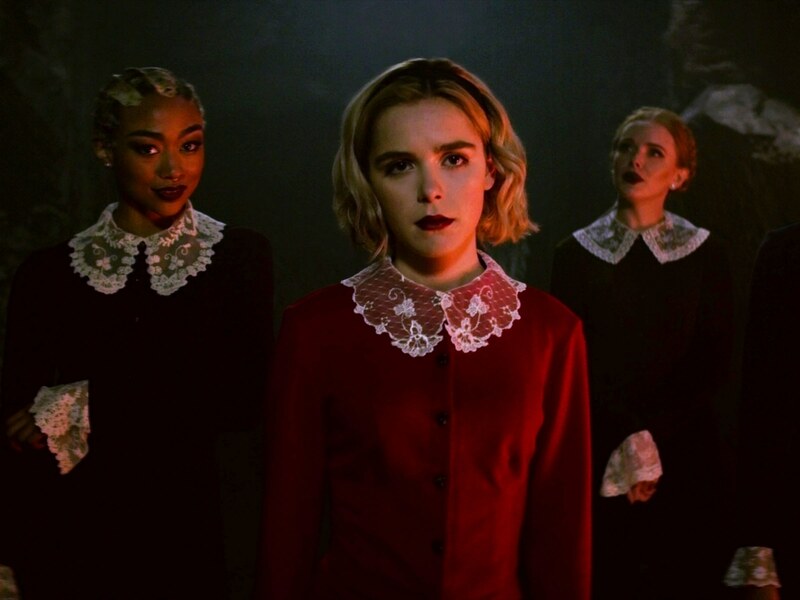 There’s also Chilling Adventures of Sabrina on Netflix. I’ve been too busy/hesitant to watch this but it has had some rave reviews. The show is based on your favourite 90s girl, Sabrina the Teenage Witch (oh how I miss her). Except, it’s a scarier, darker version. Oh and minus the fun aunts and canned laughter. Like this BBC article says, it’s a firm reminder that the shows we loved when we were young are all in need of a reboot. Gen Z need something more glossy these days. And I think they’re going to get it with this. Glossy with a side of Halloween. This new series is trying to replace Bodyguard. And unfortunately, I can’t tell you if it fills that void because I haven’t been watching (I’ve been far too busy still with The Slap). But I have seen it on the side of buses and through whispers on social media. It’s a thriller about a man who is corralled into being an informant for counter-terror cops. Juicy. Another new series. Thank you autumn. It follows cop Will Wagstaffe investigating the torture and murder of alleged paedophiles. Brace yourselves – it isn’t for the faint-hearted. Sean Penn! It’s a new television show with Sean Penn in! All the big names are rushing to the small screen now and this one looks destined for great things. It’s set in the near-future and is about a mission to Mars (just your average Thursday night viewing, then). Here, the space programme is actually run by a big company and its CEO, Laz (played by The Truman Show’s Natascha McElhone – I did a radio play with her!). Tom, played by Penn, was meant to be on the mission. But instead, we meet him watching the rocket launch from the comfort of his sofa. Let the drama unfold. Or you can venture off to the cinema to watch the latest instalment of Halloween. Anyone fancy it?